為加拿大救世軍籌募經費的寒衣送暖流於星期一 ( 1 月 7 日) 完滿結束。經過 6 星期的籌集，並得到各方善心人士的慷慨解囊和鼎力支持，2012 年寒衣送暖流的總重量達 65 噸。加拿大中文電台謹此衷心向聽眾及善長人翁說聲「多謝」! 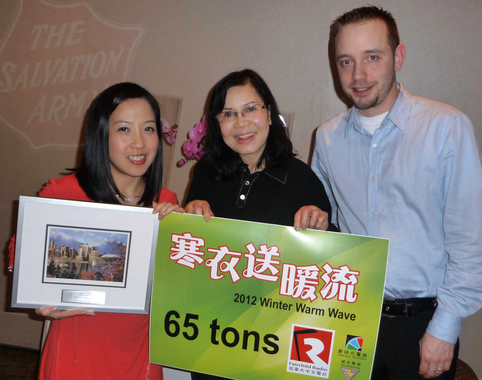 Thank you for the continuous support to the Winter Warm Wave Clothing Drive, Fairchild Radio have collected the total of 65 tons of unwanted clothing and household items for the Salvation Army. Not only do your donated clothes go to help those in need, your donations can also benefit the environment by giving them a new life. Thank you once again. See you next year! Thank You Sunshine Nation & Little Sunshine for your tremendous help!